Pet of the Month – May 2016 – O’Riley! With O’Riley already suffering from Inflammatory Bowel Disease (IBD) his owners were used to him having the occasional flare ups of IBD causing him to not be his normal bouncy self. But when they noticed he was drinking more, urinating more and having more frequent bouts of vomiting as well they brought him in to see if anything else could be contributing to this. Blood tests showed O’Riley to have higher than normal levels of urea and creatinine, substances which the kidneys excrete, indicating O’Riley’s kidney function was declining. A urine sample was taken to help confirm the diagnosis and also to check if he had excess protein in his urine (‘proteinuria’) as animals with kidney disease who develop this will benefit from additional medications. A clinically silent urinary tract infection was detected, a common complaint for animals with kidney disease, which obscured the protein results. This was addressed with a course of antibiotics before repeating the urine test. O’Riley was found to have proteinuria and started on a medication called an ACE inhibitor. An ultrasound scan of his kidneys was also performed to check for any structural abnormalities and his left kidney was found to be small, a common finding in Chronic Kidney Disease (CKD). A renal diet which restricts the amounts of protein and phosphorus, which the kidneys struggle to excrete in kidney disease, was tried but due to O’Riley’s concurrent IBD this treatment had to be abandoned. His phosphate levels were found to be too high and so an additional medication known as a phosphate binder was started. O’Riley also had regular checks of his blood pressure, as hypertension (high blood pressure) is another common result of CKD. When O’Riley’s blood pressure was found to be elevated he was also started on Amlodipine to help reduce this. Blood tests to check on his kidneys a month later showed improvements with lower levels of urea, creatinine and phosphate. 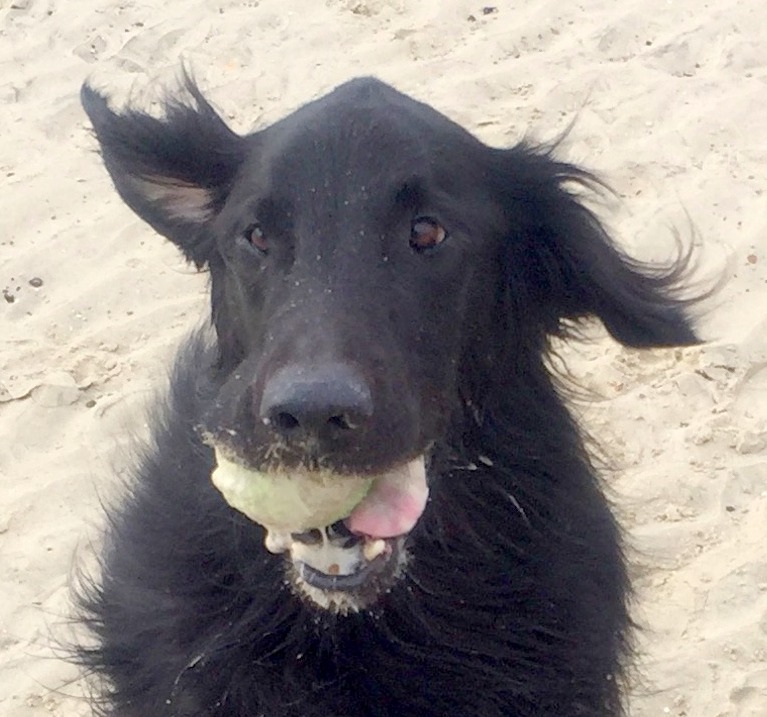 We are delighted to report that apart from an isolated occasion when his kidney disease made him feel unwell and which a brief stay in our hospital on intravenous fluids helped rectify, six months on O’Riley continues to do well. Many of you will have been told by your vet that your pet has atopic dermatitis, but what is it? Atopic dermatitis is the visible sign of a hypersensitivity (allergic) reaction; specifically a reaction to something (called an allergen) in your pet’s environment, either indoors or outdoors. It may be a reaction to pollens, or moulds, or to mites, such as house-dust mites.To complicate the issue further, some pets can have an allergic reaction to some foods, which is ‘food induced atopic dermatitis’. Hypersensitivity is when the immune system goes into an overdrive. Normally when a pet is exposed to an allergen, its immune system produces antibodies to the allergen and once it has performed its protective role it will automatically revert to normal; however, if your pet is predisposed to atopic dermatitis its immune system continues to produce antibodies, which may then result in a hypersensitivity. What are the main signs of atopic dermatitis in dogs and cats? The hallmark of atopic dermatitis is an itch, usually without any visible signs other than a reddening of the skin. Often when I ask an owner where their pet animal is itching they say “Oh, Fido does not scratch”, but dogs exhibit itch by licking, rubbing, or chewing at the itch as well as by scratching at it. The itching usually starts between the ages of 6 months and 3 years. Initially it may be seasonal – that is it occurs only at certain times of the year – but over the years that can change. Spring and summer time itching is usually associated with pollen allergies (e.g. tree, grass and weed pollens) whereas winter or all year round itching is associated with indoor allergens such as house dust and storage mites or mould allergens. Food associated atopic dermatitis is likely to be non-seasonal, unless your pet is only being fed the food intermittently (e.g. on holiday). The itchy areas of the skin are usually the face, ears, feet and underside. Often the condition is complicated with secondary infections (bacterial and/or yeast) and sometimes, just to complicate the situation further; some patients have been known to develop an allergy to the infection as well. Infections increase the level of itching and so just treating these will often decrease or stop the itch entirely. Once infections occur a rash may appear on the belly, neck and feet and your pet will lick, chew or scratch these areas. Infected skin is malodorous (has a bad smell) and, as the infection progresses the skin becomes thickened, blackened and crusty. If your pet then licks or scratches these areas aggressively, the skin can become broken or ulcerated, and also bleed. Since similar lesions can also be seen with parasitic infestations (e.g. mange) these must be ruled out, or treated, at the same time as the allergy. Recurrent ear infections are also associated with food or environment associated atopic disease. Usually the ear flap and the ear canals appear red in the early stage, which is then often followed by head shaking, discharge and swelling. What is my pet allergic to? To find out what your pet is allergic to, your vet can perform an allergy test, which will either involve sending a blood sample to a laboratory, or performing an intradermal skin test. Intradermal skin tests are when very small amounts of allergens are injected under the skin to identify which ones that particular animal is allergic to by provoking a small, controlled allergic response. Both forms of testing have their advantages and disadvantages. The results of the test should be interpreted bearing in mind the seasonality of the condition and your pet’s environment. Allergy testing identifies the allergens to which your pet might be allergic to, but the main reasons for testing should be to find out what your pet is allergic to, so as to be able to improve quality of his/her life. Your vet can use the information for therapeutic purposes and to look at means of reducing the allergen load in the environment. The lower the allergen load, the lesser the itch and the easier it will be to keep your pet comfortable. 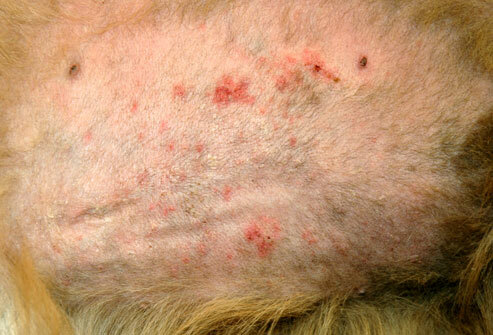 One can compare atopic dermatitis in dogs to hay fever in people. If you have hay fever and you stand in a field full of flowers whose pollen you are allergic to, you will suffer severely, as opposed to if you stayed indoors when the pollen count is high. The same goes for dogs, by reducing the allergen load you will be helping to relieve your pet’s symptoms. Can I cure atopic dermatitis? In one word “No”, but you can manage the condition successfully. Atopic dermatitis in dogs and cats can be compared to asthma in people. Asthma can’t be cured but it can be managed; and just like asthma the management of atopic dermatitis is life-long. It is therefore important to put in place measures that are going to have the least side-effects for your pet in the long term that will provide him/her a good quality of life and that are the most cost effective and affordable for you. How can I manage the condition? Unfortunately some treatments work some of the time but not all the time and so you may need to switch treatments periodically. Some treatments may result in undesirable side effects and so may need modification. Any bacterial (mostly staphylococcal) and/or yeast (Malassezia) infections should be treated at the outset. Antibiotics for bacterial infections need to be administered for 7 – 14 days beyond clinical cure and the duration of treatment is generally determined by the depth of the pyoderma. For yeast infections a shampoo containing either 2% chlorhexidine/2% miconazole or one containing 3% chlorhexidine have shown good efficacy and will suffice; however, if the infection is severe your vet may opt to prescribe antifungal tablets. Because there is a tendency for infections to recur it is best to bath your pet once or twice a week on a regular basis, which will keep the microbial load on the skin low and thus help reduce the frequency of infections. Glucocorticoids (steroids) will stop the itch in most cases, but need to be used with caution, especially if used for a long time. In the short term they can increase water intake, increase urination and appetite. Some owners and pets find these side effects distressing. In the long term they can affect almost any organ in the body, therefore, even when well tolerated, they should be used with caution and your pet should be monitored regularly. Topical steroid containing sprays and ointments may be useful for targeted areas but with long term use thinning of the skin, infections and systemic side effects can occur. Cyclosporin is used to damp-down (modulate) an over-reacting immune system in an atopic pet. One starts with a high dose and then tapers it down to alternate day, or better still twice a week, treatment. The most common side effects with ciclosporin are vomiting and diarrhoea. In some dogs, gingival hyperplasia and papillomas may also occur. Oclacitinib is another immunomodulating drug which specifically targets the pathway that results in an itch. It is effective and can stop itching rapidly. This is the newest drug on the market and the reported side effects are vomiting and diarrhoea in a small number of cases. It can be used both short term and long term; however, given that this drug has now been on the open market for only a few months (at the time of writing this) it should be used with caution as side effects with prolonged use are not known. Antihistamines; the response to this group is variable and they are often used in combination with steroids in order to reduce the steroid dose. Allergen specific immunotherapy is the most specific treatment for Atopic Dermatitis. It involves either an injection, or an oral dose of the allergens your pet is allergic to, to modulate the immune system. It has responses ranging from roughly 33% where there is complete cessation of itch, to 33% improving but requiring additional treatments, to 33% where there is no response. If your pet responds well to immunotherapy, it is likely to have the least adverse side-effects and to be the most cost effective treatment in the long term. Omega -3 and Omega -6 essential fatty acids help the skin function by altering the lipid barrier and by reducing inflammation. 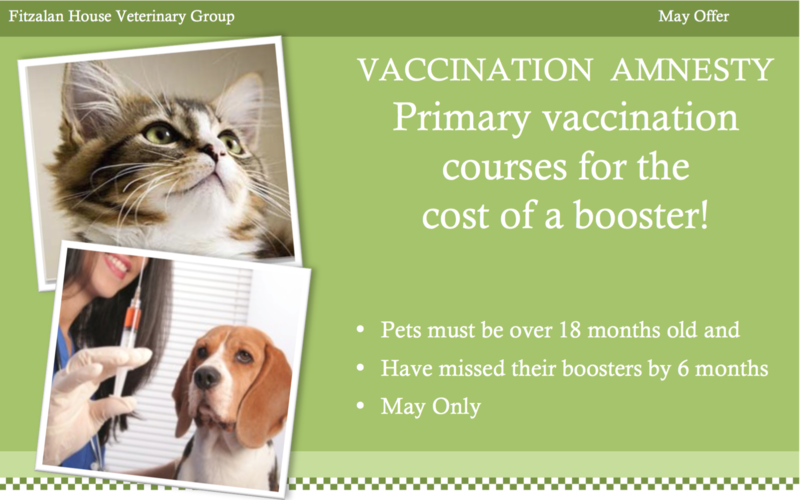 On their own they are unlikely to benefit your pet but can be helpful when combined with other treatments. Diets that are high in essential fatty acids (EFAs) also help. Moisturisers containing ceramides help maintain the skin barrier, which in turn reduces the penetration of allergens and therefore your pet’s reaction to them. Bathing with an oatmeal based shampoo can also help relieve itching and re-hydrate the skin. Atopic dermatitis is a lifelong condition that requires life-long management; and often more than one type of treatment will be required. So, when your vet chooses a treatment, it should be efficacious, suitable for your pet with the least side effects, easy for you to administer and affordable. Most of all it/they should improve your pet’s (and your) quality of life.